For those of you that don't frequent the JTR forums, I copied this over to illustrate the difficulty in getting the Whitehall torso into the particular vault it ended up in. The same vault the workers stored their tools in every night. Please note: In my first post on that thread my red arrow is in the wrong location for the body. I corrected with a more detailed map (the one I have a link to below) later on in the thread. Here is the image of the actual basement of New Scotland Yard. The purple arrow is the approx. 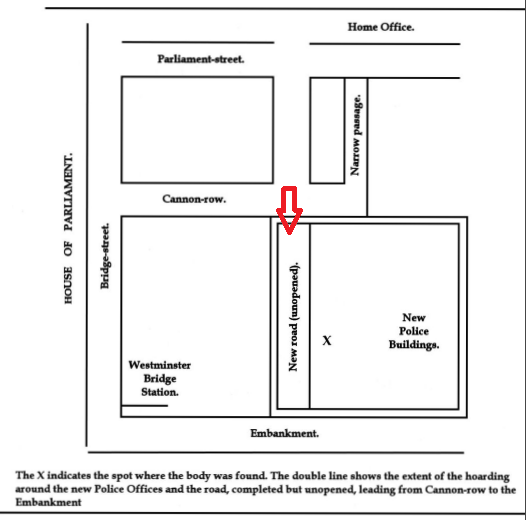 location of the torso. The other stuff I will have to post an explanation after I get home from work. I think this points to the killer having special significance in where he placed this one and or it being one of the workers. "I do not think it possible that any one could have lowered the parcel from Richmond-mews"
Richmond Mews is in the north-west corner of the building site, whereas we have the torso discovered in the south east somewhere. If this is correct, it would go without saying that it was impossible, yet Brown's answer, according to the Telegraph at least, seems to suggest the idea might have been plausible. Do we have the torso location all wrong? "By the Jury. - We have had tools lost from the works. I do not think it possible that anyone could have lowered the parcel from Richmond-mews (at the side of Whitehall-gardens) and then have carried it across the grounds to the vaults"
So it sounds to me that the juror was wondering if the body was lowered over the hoarding at that point, rather than directly into the vault as I thought they were suggesting. Perhaps the buildings in the mews were close enough to the fencing to make that possible? "The witness [Wildbore] was here asked to look at a plan prepared, and he pointed out the spot under which the vault was placed, thus being on the westward side of the works; and he pointed out also the entrance of the workmen in Cannon-row. He pointed out, too, the way he went to the vault, and the plan was handed to the jury. The witness resumed. - The way I went to the vault was not difficult to me, but it would be rather puzzling to any one to find the place if they were not acquainted with the way and the spot." This map was printed in one of the papers. Rob Clack also included this map in his Ripperologist article. The arrow is mine from another post pointing out one of the entrances on Cannon Row. Thanks Jerry. That map shows the torso on the Sourhern side, geographically speaking. But if it were held up at the inquest that way round, it may explain why the Times reported it on the West side. Looks like that may be the case, Joshua.